All templates above use Monterey BT font which is free to download from SoFontes. 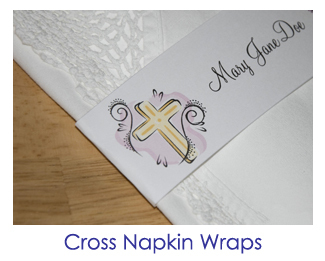 New to Napkin Wraps? 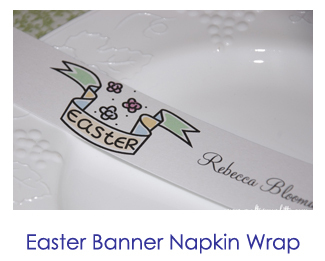 No worries, visit this post for step-by-step instructions on how to use my napkin wrap templates! 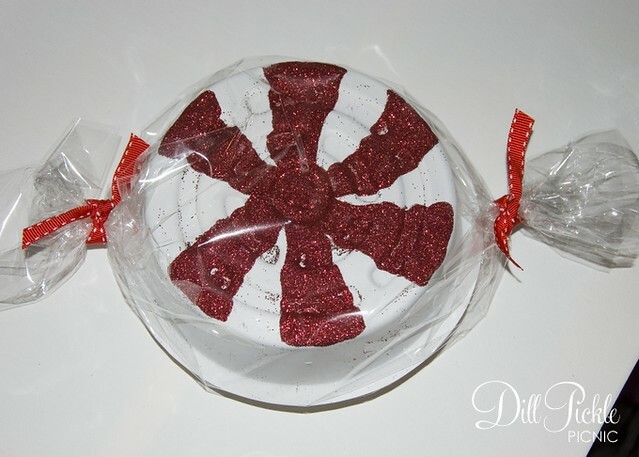 Earlier I posted some photos from my inspiration candy pieces…they were white, glittery, and peppermint-y. 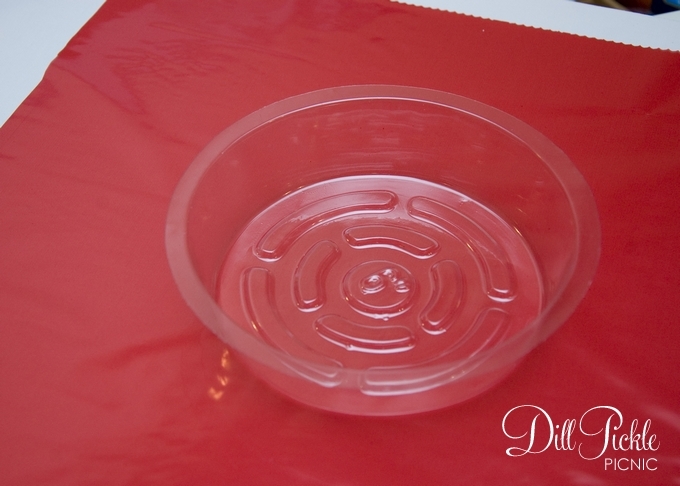 The plant saucers I have are clear…so that meant I needed to try to make them work as well as buying new white ones. These took a bit longer than those in the first post since they needed some drying time, but we used them to decorate our mailbox just a bit. 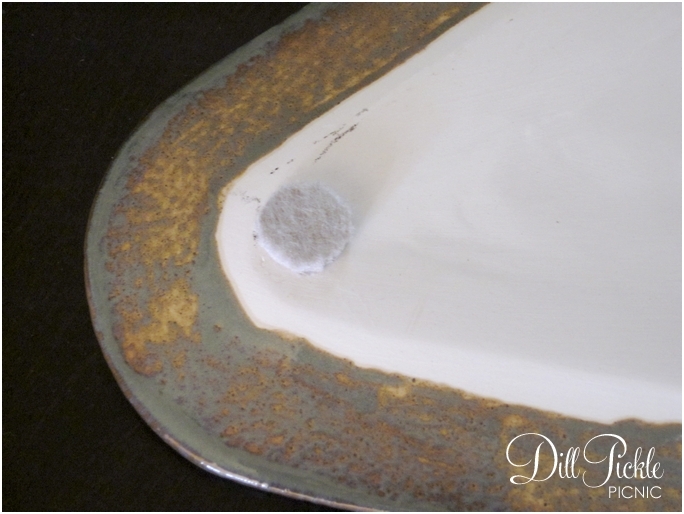 If starting with clear saucers start by painting them white. 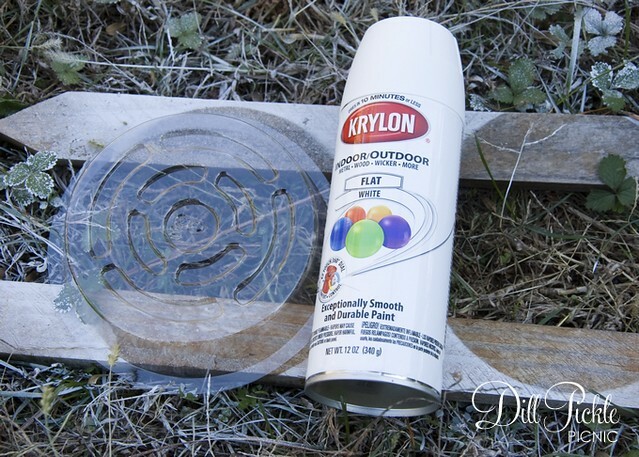 You could use acrylic paint and a brush, or spray paint works great for this project. I used a can leftover from another project and gave the saucers a quick light spray, and then let them dry thoroughly. 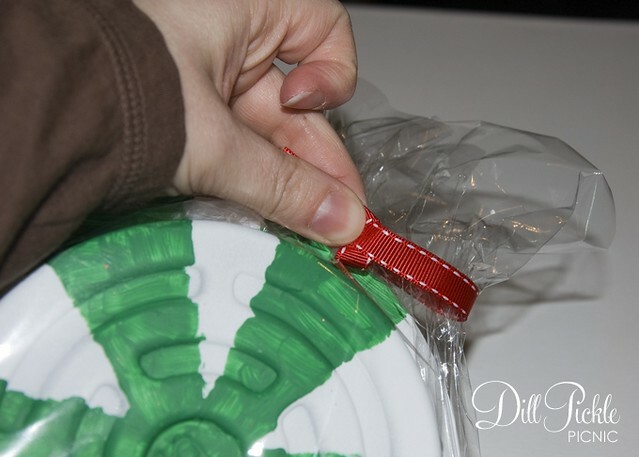 Once dry, it’s time to decorate your candy pieces. I start by lighting outlining the shapes of the areas to be painted on the top of each piece with a pencil. 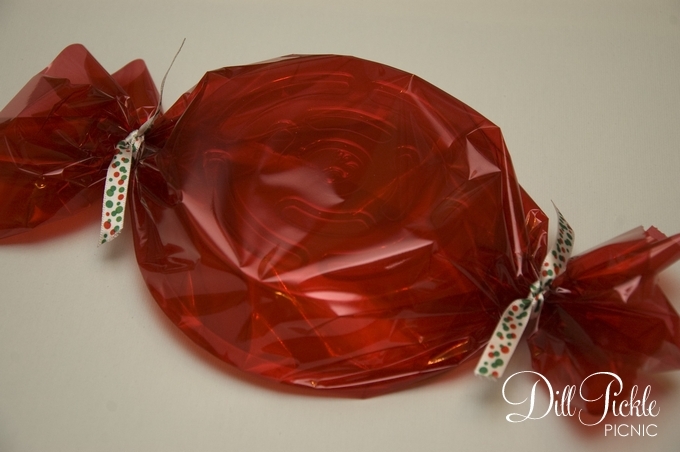 For painted pieces use your acrylic paint & brush to fill in each of the candy sections. Sit aside to let dry (I leave mine overnight). 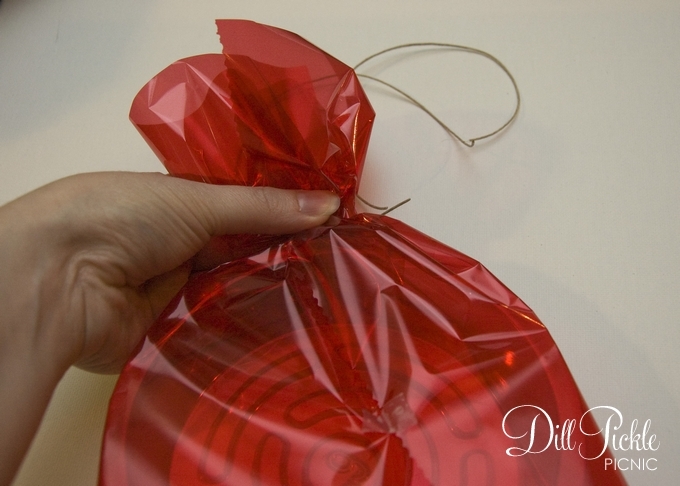 Now carefully gather one of the ends and tie with a piece of ribbon. Don’t worry if your ends are a bit long, you can always trim them when they are finished. Now, you are all ready to display your candy! 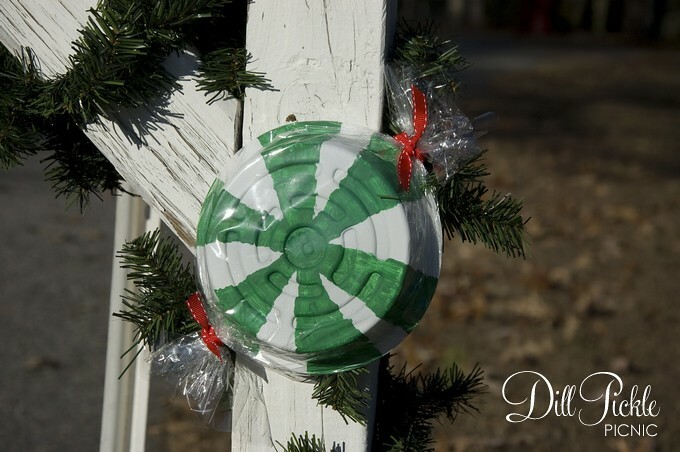 Want to add your candy pieces to garland? 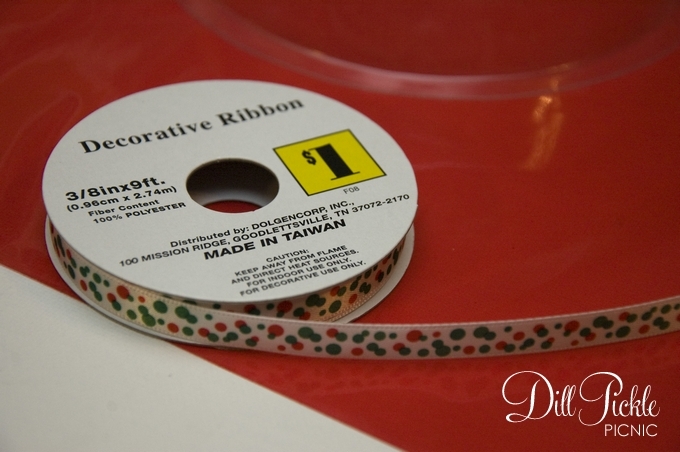 Easy, just slip pieces of floral wire behind your ribbon ties on each side and use to secure to your garland! 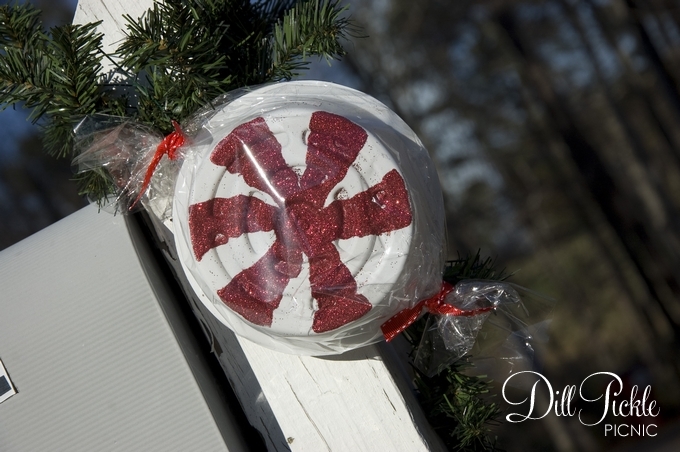 Then stick around…hopefully I’ll have a fun reuse candy bunting project to post later this week! 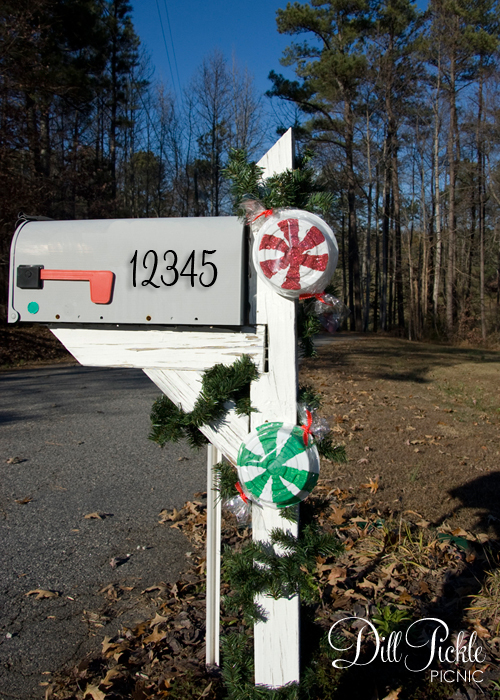 How do you decorate your mailbox? Have any fun mailbox inspiration links to share? 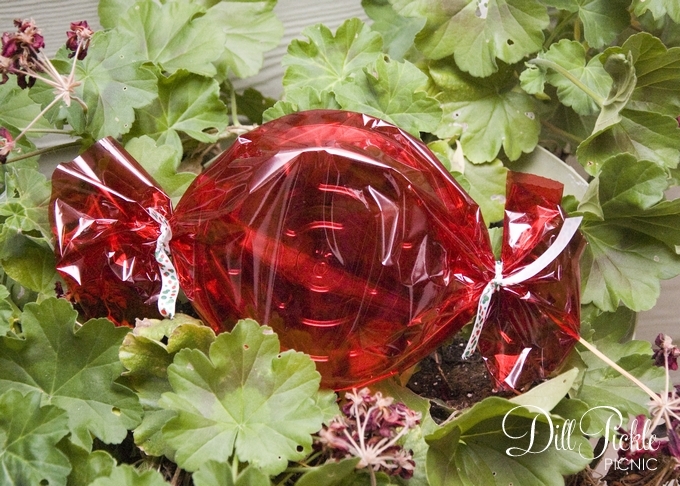 I mentioned in my first post about the Large Candy decorations that was inspired by decorations I saw outside my local Pike Nursery last year. 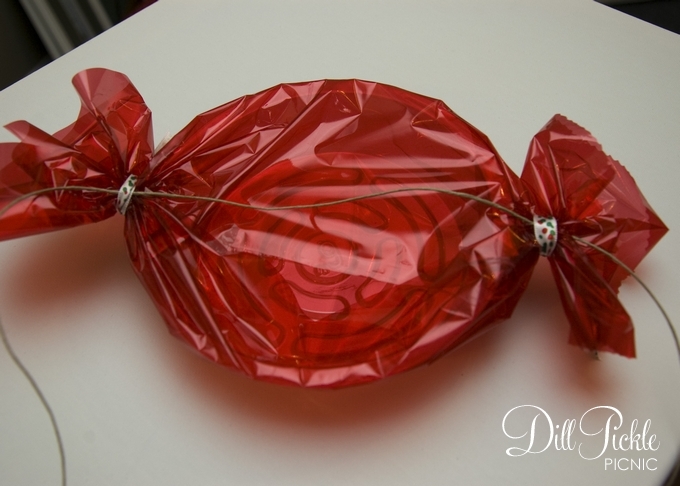 It took me forever but I finally found those photos….see aren’t these huge candies fun? 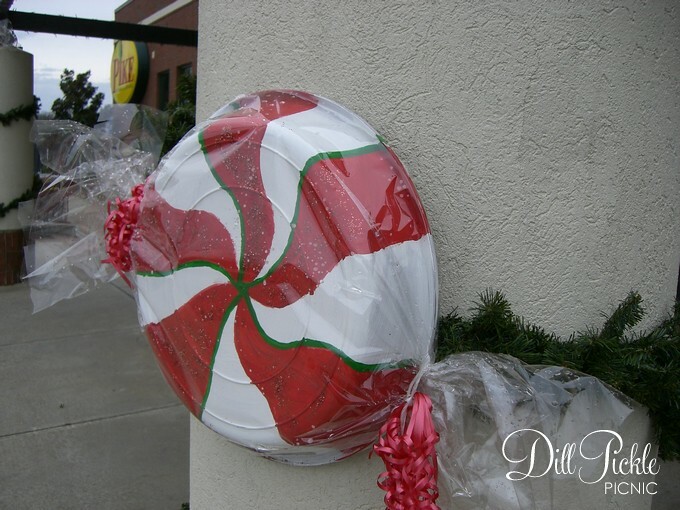 You can see that they used large white saucers to make 24 inch pieces of candy to decorate the front of their store…who says businesses can’t be creative & crafty! I’ll have the second large candy post up later tonight or first thing tomorrow and photos of how we used some of them. 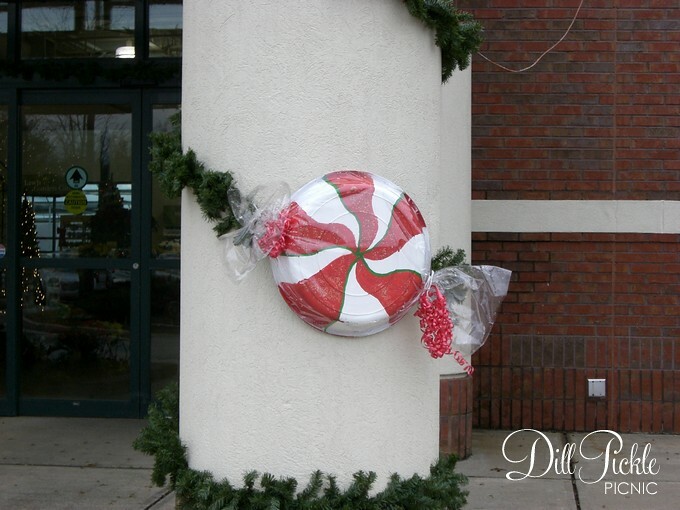 How has a local businesses decorations inspired your own holiday creativity? Isn’t it cute? I love to make yo-yo’s, making them is quite soothing to me for some reason. Typically I have a pile of them laying around with no clue how to use them and after seeing a yo-yo pumpkin this fall thought I should attempt to make a tree. 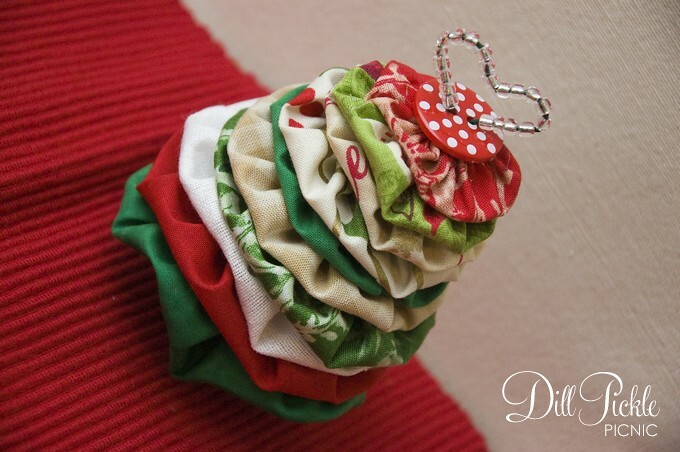 Then I saw this fun tutorial from Kiwi at Heart and she had made exactly what I was dreaming up in my head. She does a great job explaining the process…I only did one thing differently. Where she uses templates to cut her circles, I decided to try out this fun little gadget I picked up 50% off at Joann’s a while back. I was able to just adjust the setting to match her dimensions and cut the circles out with no templates. It works much like using a string & pencil to draw a circle…only this bad boy has a sharp pin to hold it in place and a super shape rotary blade. 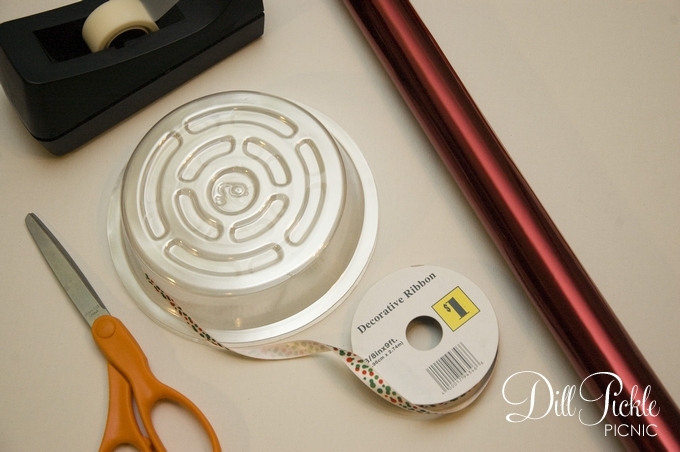 Such a time saver…especially when you love to make yo-yo’s as much as I do! I have a quilt I want to make this year that involves circles and I am thinking this little guy might be a life saver when I get to that point. So if you cut out circles-o-plenty of like I do…it might be the best $15 you spend. 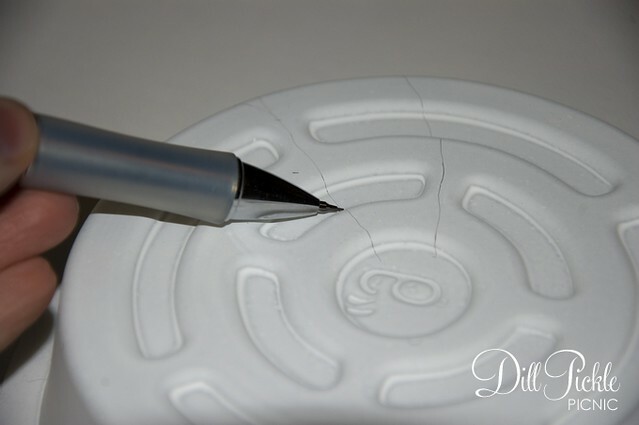 It uses a really sharp rotary blade, so you absolutely must use a cutting mat underneath it. It can also be a bit odd to hold and turn at first, but once you get the hang of it that isn’t really a problem. 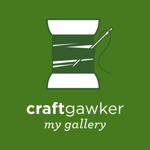 Any other recommendations out there for yo-yo construction or quilting gadgets I might also find indispensable? Please, share!! You might also check out Mummy Crafts to see her take on the same tutorial, which also includes a template for cutting the circles. Fine Print: I have not been compensated in any way by either Joann’s or Olfa for my review of this product. It is simply my opinion based on usage of the product I purchased. I had almost forgotten about posting this little quick project. Last Halloween my FIL hosted a bit of a Halloween party in his “under renovation” home. The “under renovation” part meant we didn’t even start decorating until a few hours before everything was to start. 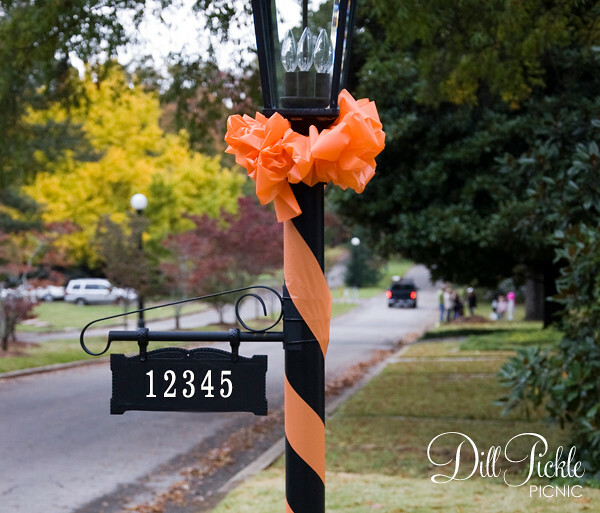 I learned it’s amazing what you can throw together really quickly…including this fun addition to his street number light post that cost less than $1 to make. 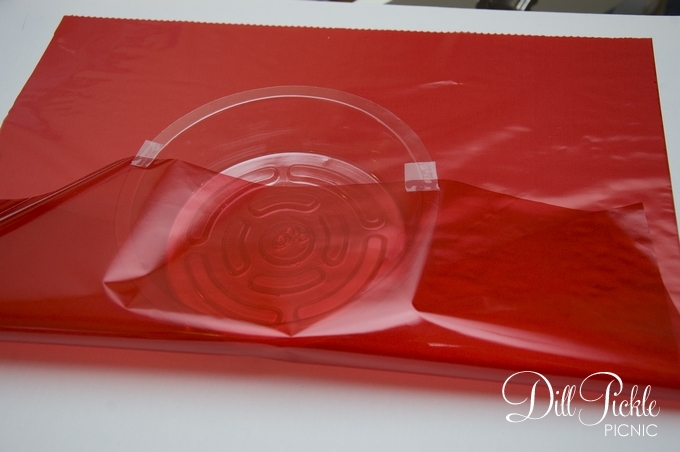 Carefully unfold the initial vertical folds of your plastic table covering so that it is still folded vertically. 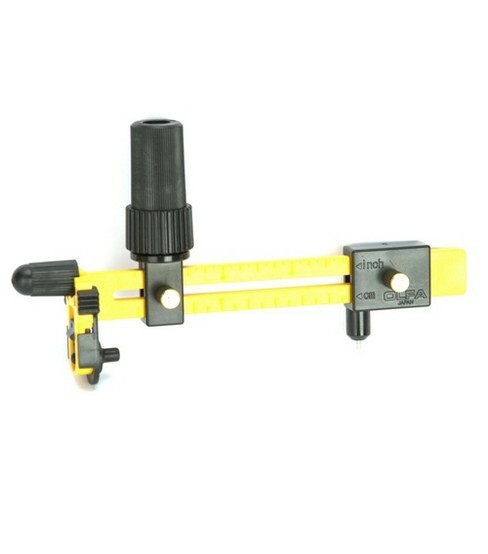 (This will allow you to cut longer strips quicker and more precise). 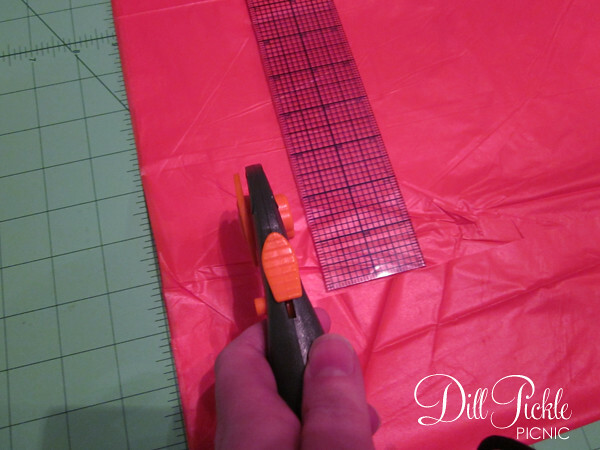 Using your scissors or cutting tool measure over approximately 2 inches and cut up the length of the outside vertical edge of the table covering. Repeat 3 more times so that you have 4 strips. Carefully open up your strips so that you have one long piece. Hint I keep mine doubled so the color is a bit more pronounced. Using your tape attach the bottom of the first strip to the bottom of your post at the angle you wish your strips to run. 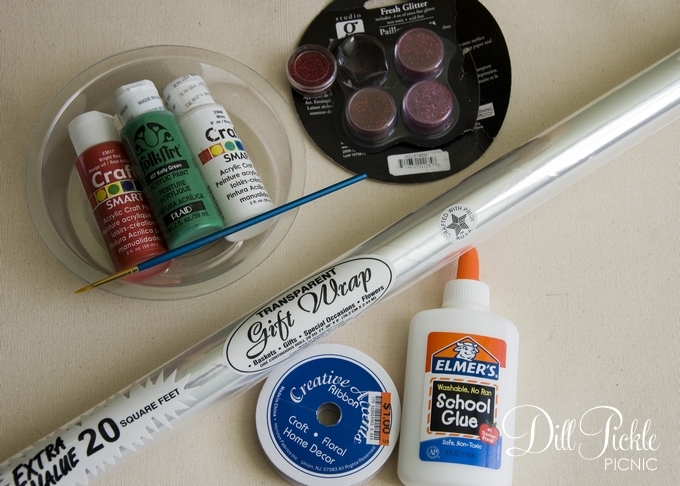 Carefully wrap the plastic strips around over the tape and then start carefully wrapping the plastic strip up the length of the post. Make sure to keep the strips pulled just tightly enough to keep it in place. When you reach the top, use an additional piece of tape to hold it in place. Don’t worry about the tape showing since the bow will cover it up. Take the second strip (again I always use a double layer of the table cover) and hold it in your hand about 6 inches from the end. 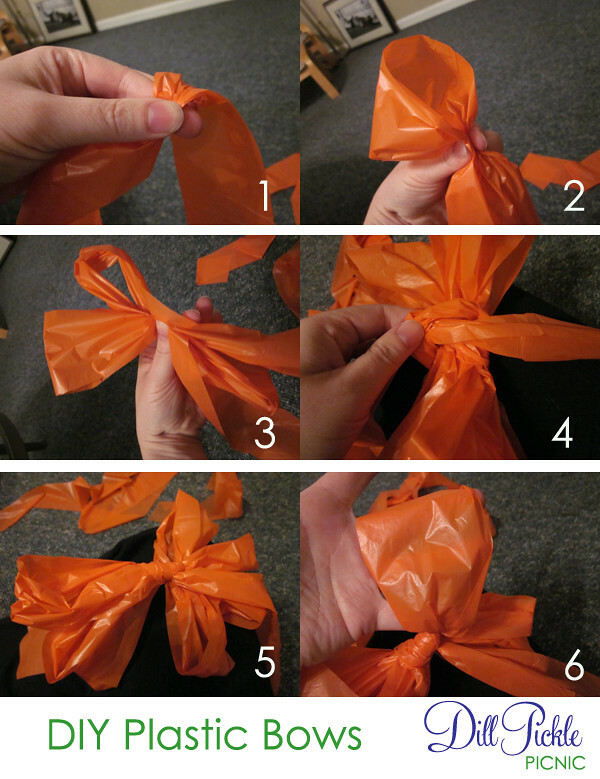 Make a loop folding it to meet your fingers in the center. Repeat on the opposite side. Repeat steps 2 & 3 until you have approximately 7 inches of the strip leftover. Loop the leftover strip around the center and tie the two ends together. Carefully open up the loops of the bow, pulling apart the two sections to “fluff” up the bow. Repeat using remaining 2 sets of table covering strips. 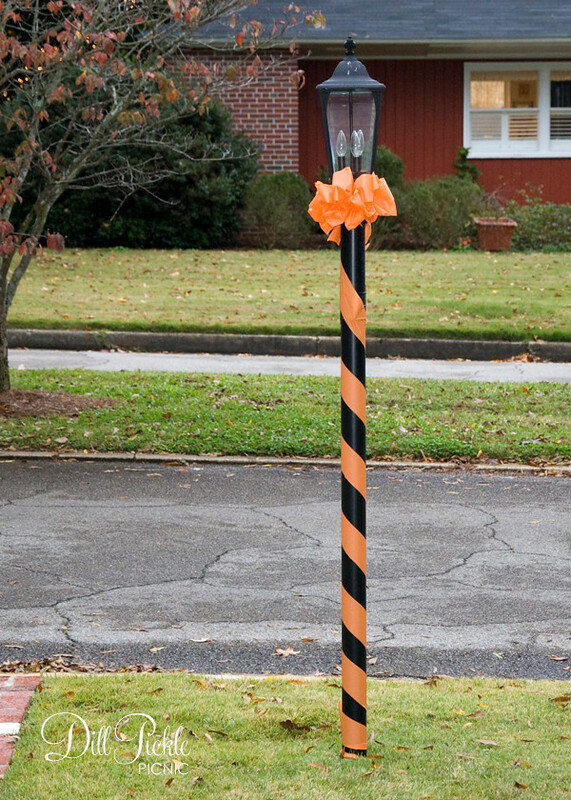 Using the 6 inch trailers tie the bows around the top of the light post. 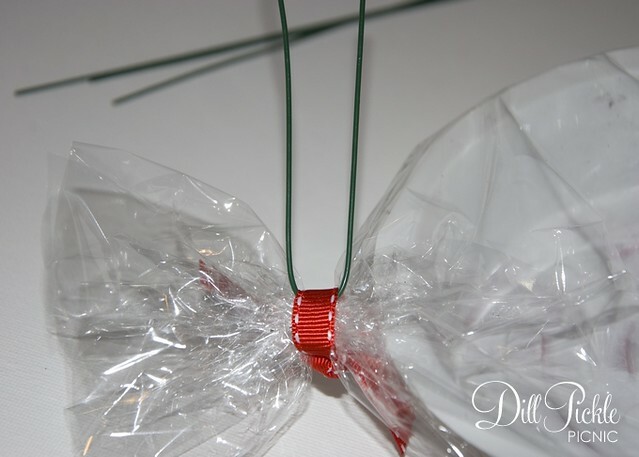 By tying them all side by side it the bow will go completely around the top of the post and give a much fuller look. Either trim the trailers to have pointed ends, or tuck them inside the bows so that they don’t show. The great thing about this project is I still had about 1/2 of my table covering left…which was a perfect size to either cover the long island in his kitchen (or make a Halloween wreath?). Also, since it’s made from plastic it wasn’t an issue when it started raining a few moments later! 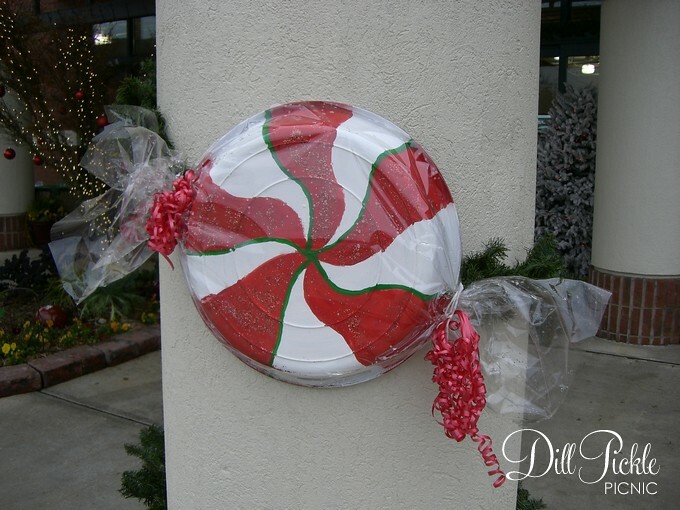 You could also use this same approach using any of the plastic table covers found at your local dollar store…I’m thinking a red and white candy-cane look could be fun for Christmas! 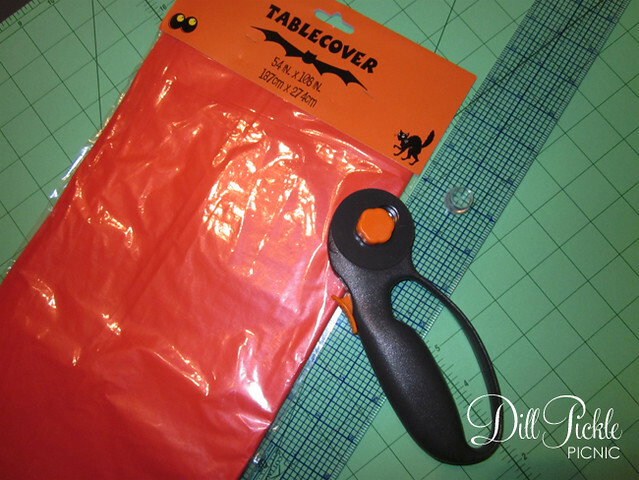 Looking for more Fall or Halloween projects? Check out the side bar to the left for a quick listing! So yesterday you saw our first re-purposed item coaster attempt, today I”ll show you the latest additions and how they came about. Back in June, the boy and I celebrated one glorious year of marriage with a fun little trip to Asheville, NC. 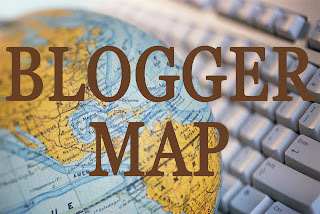 We took a couple days off from work, and the hubs planned out the where/when/how and kept it as a surprise destination until the morning we left. He chose Asheville because 1)I had never been 2) it offered plenty of outdoor activities (which we both enjoy) 3) it offered nice lodging & dining options and 4) being at a high elevation that Atlanta it would be a nice relief from the oppressive heat that has plagued the Atlanta area this summer. All I can say about reason #4 is HA! Mother Nature definitely didn’t get that memo, and instead it was a sweltering mess of high temperatures mixed with humidity from the depths of places known for fiery torture. 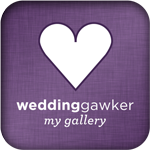 Any of your familiar with Weddingbee might remember that Mrs. Snow was getting married in Asheville in June…yes, it was the same weekend and she blogged about the crazy weather swing as well. So, we rearranged several of the things the boy had in his plans so we didn’t melt away in the oppressive heat…and in the midst of wandering around we realized that weekend was also the River District Artists Studio Stroll. So, we picked up two of the square tapas plates. Once home, we again brought out some felt pads from the local dollar store (the thinner of the selection this time) and added one to each corner of the plate. Can you tell we tend to purchase only mementos that have an actual use around our house? We tend to buy art or handmade pieces to commemorate special trips or events…that and I buy magnets (which I still need to figure out what to do with since I’ve picked up magnets from my travels my entire life). What do you pick up as mementos of special occasions or trips? We don’t like coasters. There…I’ve said it out loud. That’s not to say that we prefer to place our sweating beverage glasses or bottles directly onto surfaces, I’m just saying we haven’t found any that we BOTH found aesthetically pleasing. Then something happened…we stopped shopping for them and instead focused on things we could make into them. 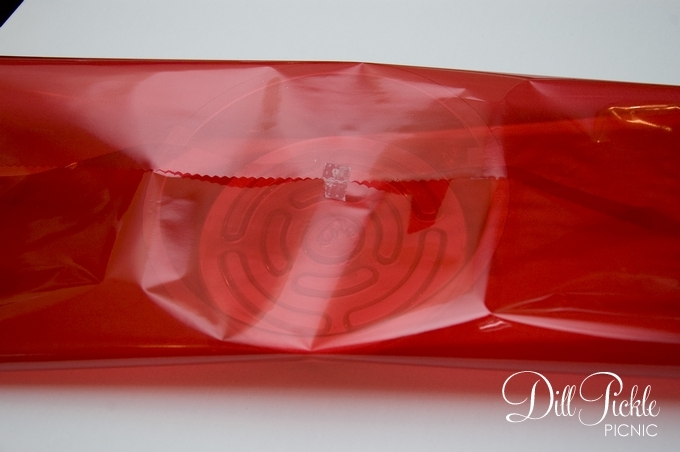 This is the story about how we used these little guys from the local dollar store to solve our coaster dilemmas. Last year while on a bit of a family vacation with the boy’s family we noticed this fun piece of flattened pottery on a deck side table in the house we were staying in. It was the perfect size for a couple of glasses and still appealed to both our senses of design. 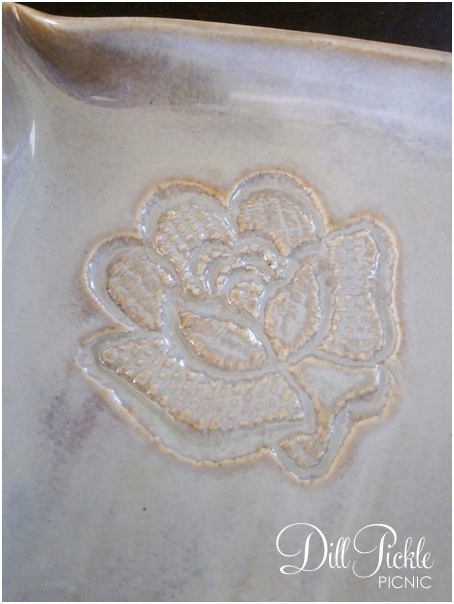 Interestingly enough we already owned a bowl in a similar pattern from the same pottery studio that the boy uses on his bedside table to store the contents of his pockets each night. Do you see where I’m going with this? Yep, we looked around the shops that weekend in search of a plate to use as a coaster on our living room end table. 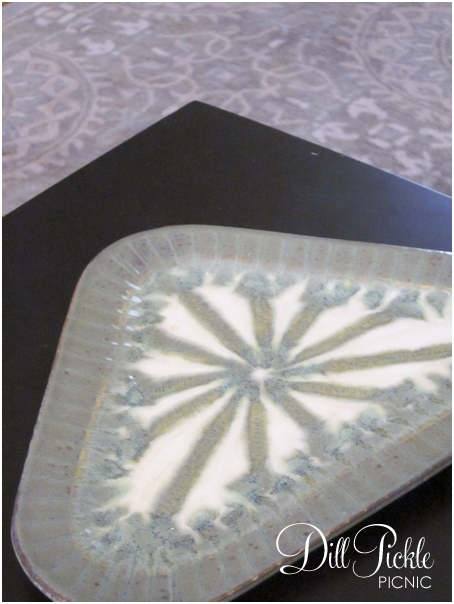 We ended up choosing the small triangular plate from The Good Earth Pottery, their stuff is great in not only is it appealing to the eye, it is also dishwasher and oven safe as well. Then to keep our fun new find from scratching up our tables we just added one of the little felt pads to each corner. Instant extra large coaster! What’s really nice is when I am lazy and fill up a Nalgene bottle with water…it fits on the coaster with no worries as well. As do ice cream bowls, large coffee mugs…you get the picture. You can see in the next photo how the colors in the plate match our rug, but sadly what you can’t tell is how nice it looks on our end table. Overall, I’m really pleased with how our initial attempts to use something not originally intended as a coaster worked out. 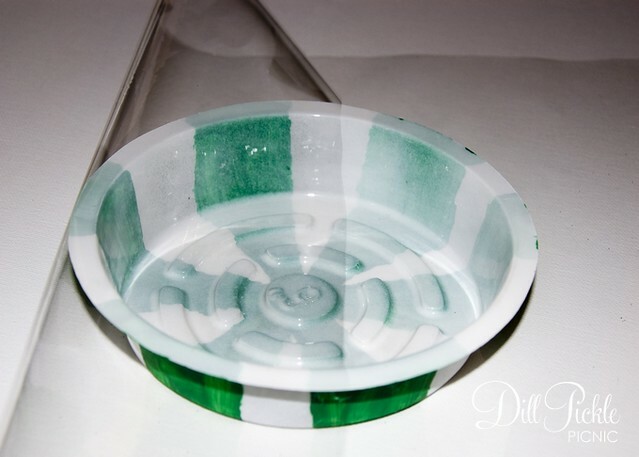 The benefit we never considered when we initially picked this piece was how any sweat from glasses placed on top would pool in the small groves of the pattern , this means the bottom of the glass stays drier than if the piece were a completely flat surface. Plus, the coaster also serves as a very useful reminder of our trip to Highlands, NC. 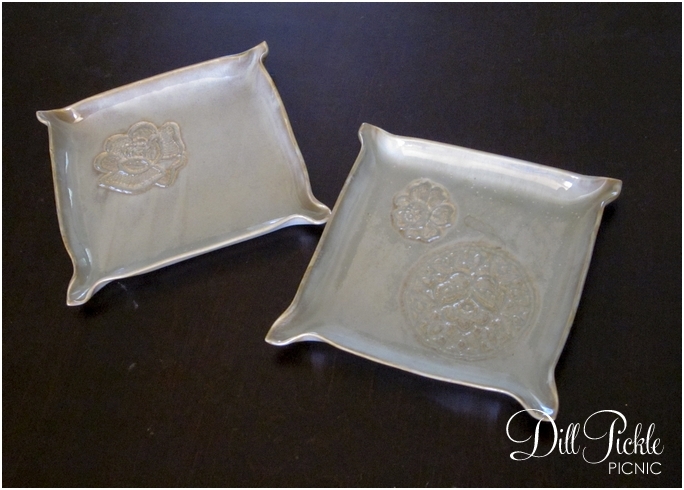 How have you re-purposed items to create the “thing” that seemed to elude you otherwise? Was it a success? Well hello there! I’ve missed you the past week or so…but things have been busy in the Pickled household. 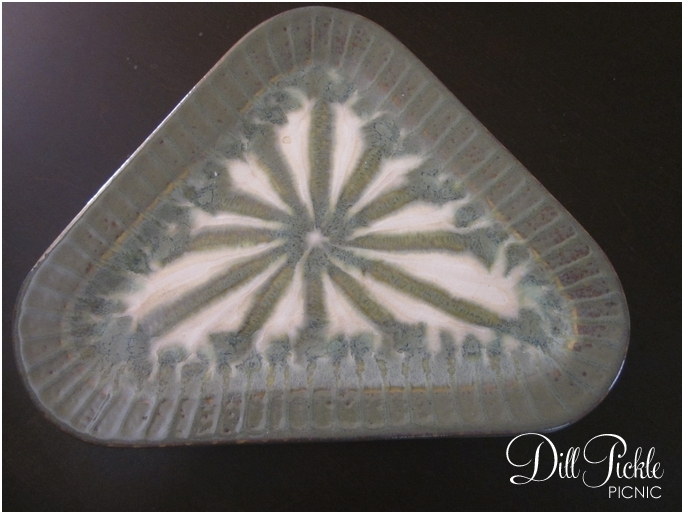 In the midst of everything I finally managed to get the Dill Pickle Picnic Etsy shop open! Yay! Right now it’s looking a bit sparse but I’m hoping to fill it up a bit more over the weekend. So when you have a minute check it and let me know what you think! 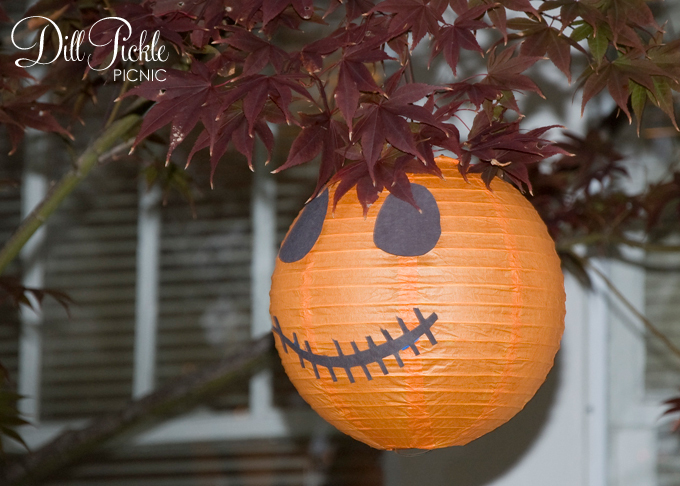 Check out this post from last year to learn how to whip up your own pumpkin lanterns using a few dollar bin items! What about you guys? 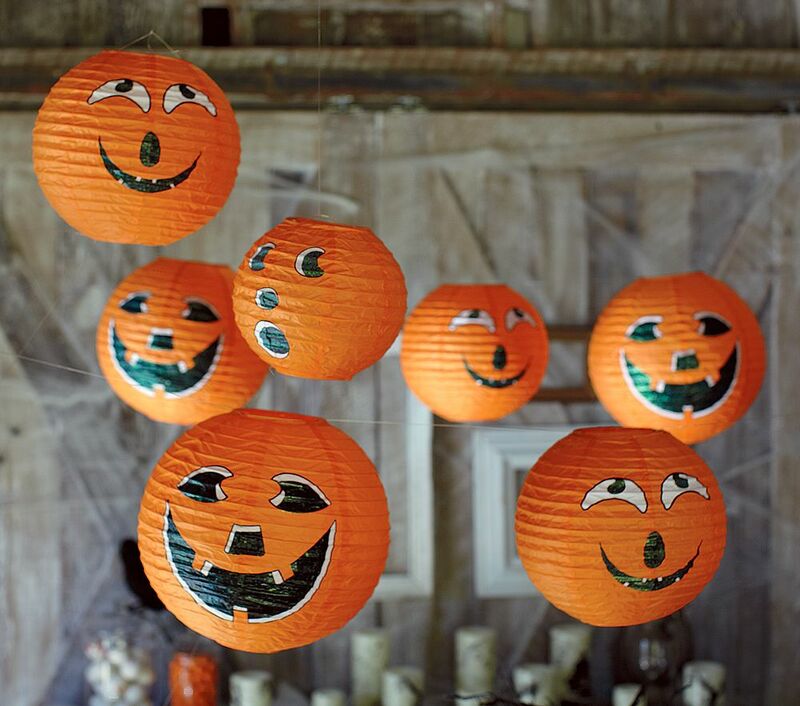 What are you decorating plans for Halloween? Any fun, yet cheap suggestions to share? This is a project I have wanted to attempt for quite a while. 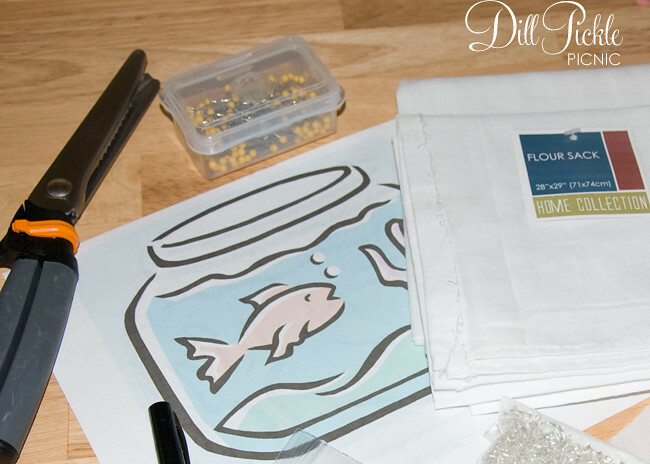 I’ve read several tutorials utilizing freezer paper for applique methods wondered if it was as easy as it seems. All in all I’m happy with how it turned out, but I did have several problems along the way. I used Styrofoam since it is readily available in the trash heap at my office. Cut your material down to the correct size. 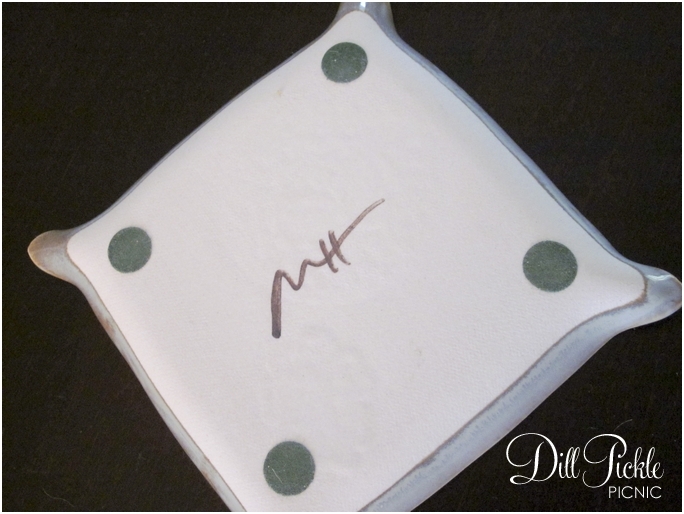 Measure the opening to your photo frame and add 1.5 inches to both the horizontal & vertical measurements. You will use this later when attaching to the frame. 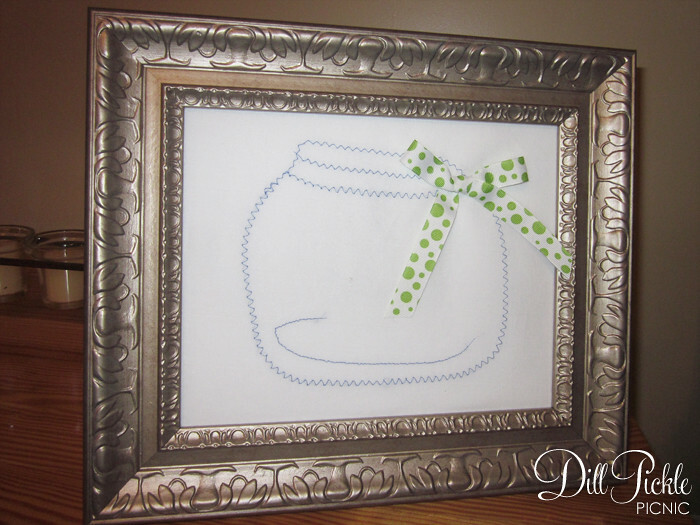 Transfer your pattern to the freezer paper. This can be accomplished in one of two ways. 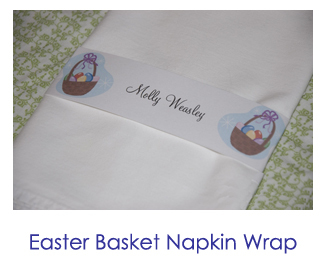 I chose to simply print out my template and use a marker to trace it onto the freezer paper. 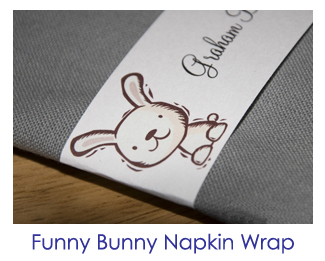 However, you could also run the freezer paper through an ink jet printer on the paper side. 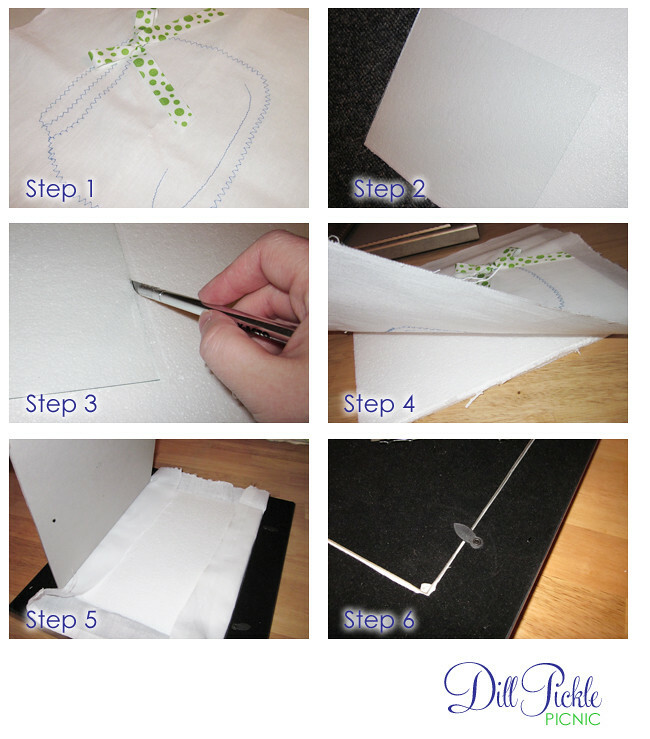 Remove your pattern and center your pattern in the middle of your piece of fabric, paper side up. 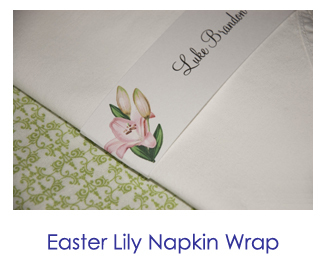 Using the iron with no steam, press your freezer paper to the fabric. I was a bit unsure how it would hodl so I also pinned the corners for added “holding power”. 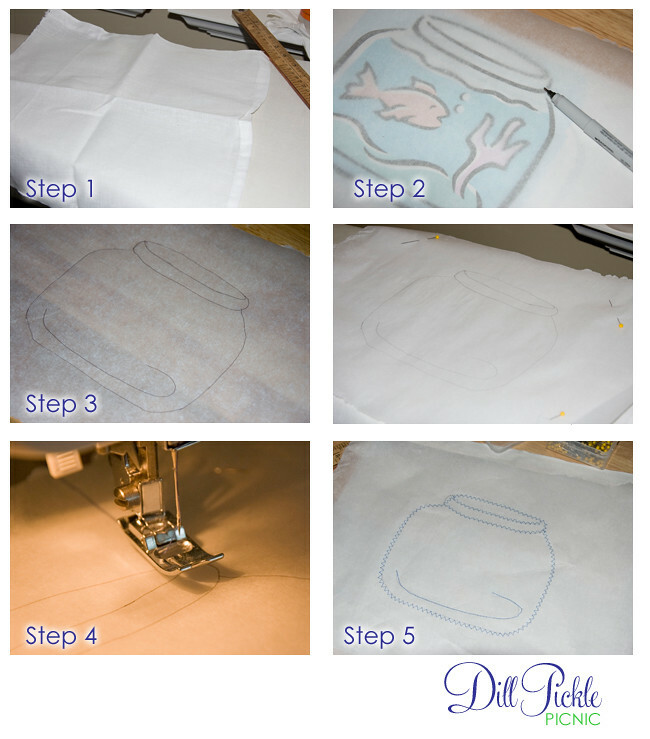 Now using your sewing machine, simply sew over your template lines using your favorite stitch setting. For my message board I chose to use a fun zigzag stitch. You can see I got off my pattern a bit, but don’t worry…you can fix this later. 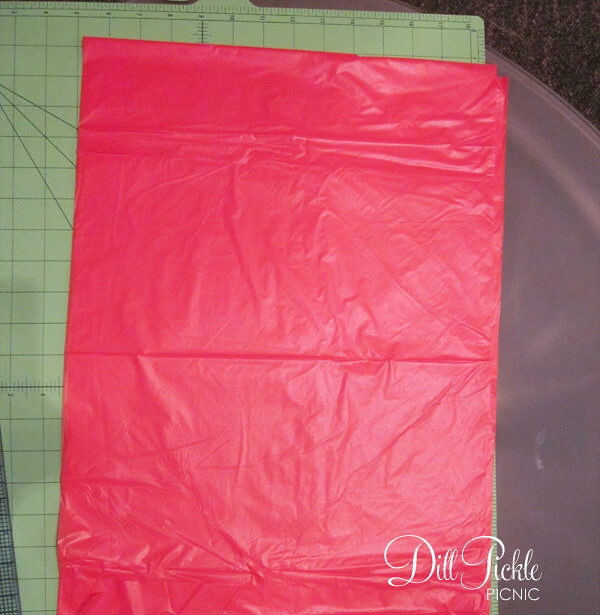 Remove the fabric from your machine and carefully tear the freezer paper away. This is where I had issues…major issues. I ended up having to use the craft knife to carefully cut the paper away. I don’t recommend this since it’s also easy to cut your stitching this way. Now is the perfect time to embellish your fishbowl a bit. 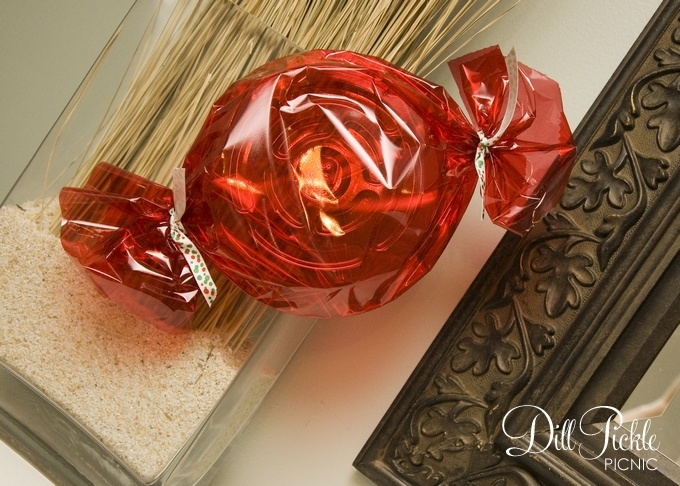 Remember by mistake, I decided to use some leftover wedding project ribbon to add a colorful bow to this fishbowl. I just tied the bow, trimmed and singed the edges of the ribbon, and then stitched it to the fabric. 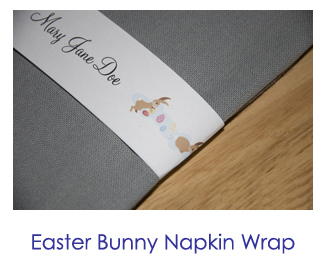 Press the fabric when you are finished to create a smooth surface for your message board. Now it’s time to cut your cork or Styrofoam. The easiest method I found was to place your material on a cutting mat. 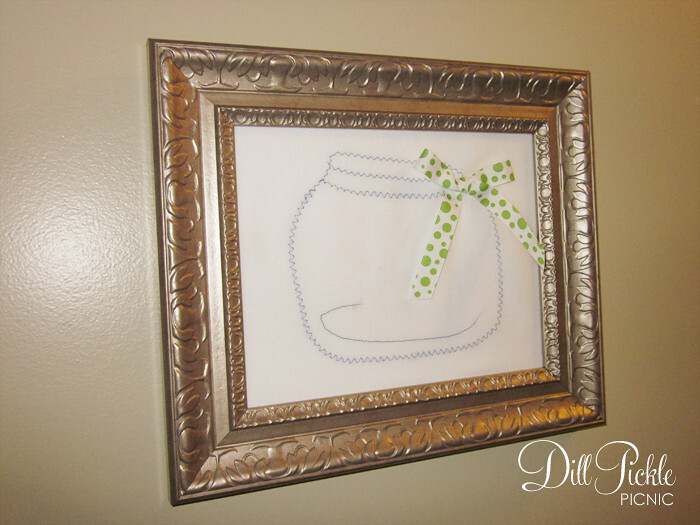 Take the glass you removed from the frame and place onto your foam. Line up the outside edges so you have fewer cuts to make. Using an Xacto knife (and being careful not to cut yourself on the glass edge) cut around the edge of the glass pane. Make sure your cuts are over your cutting mat. Time to put it all together. Carefully center your fishbowl fabric over the cut piece of foam/cork. 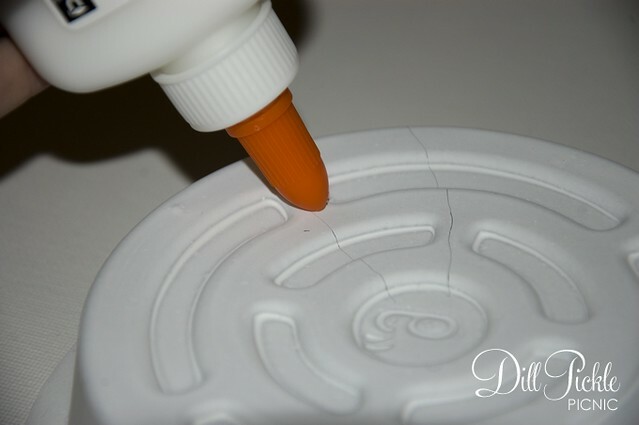 You could easily use spray adhesive on the back of the fabric to help hold it in place while you complete the assembly. 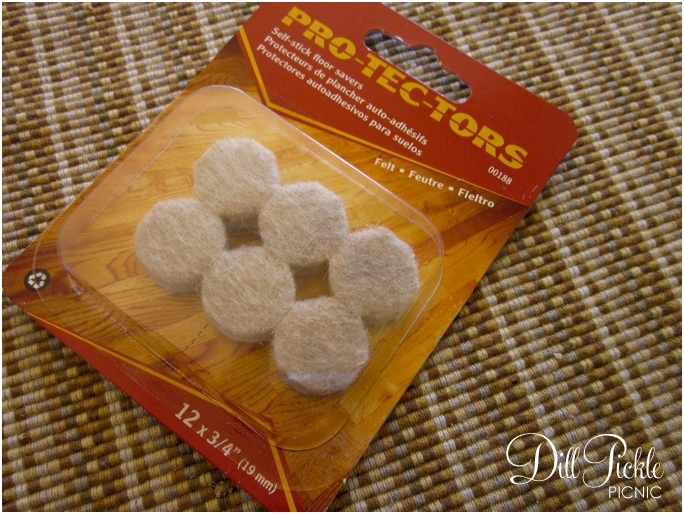 Take your foam/cork sandwich and insert into the opening of your frame, and fold edges to the center of the foam/cork. I used clear packing tape to hold the edges down. Replace the back of the frame. If it doesn’t sit completely flush, you could also use clear packing tape to hold the back securly to the frame. 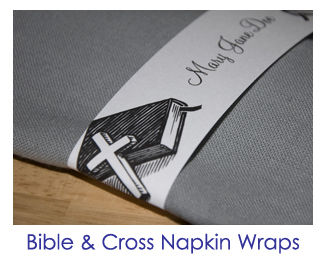 This is necessary to keep everything all nice and wrinkle free. Everything used came from my stash, except the Flour Sack towel from the dollar store. 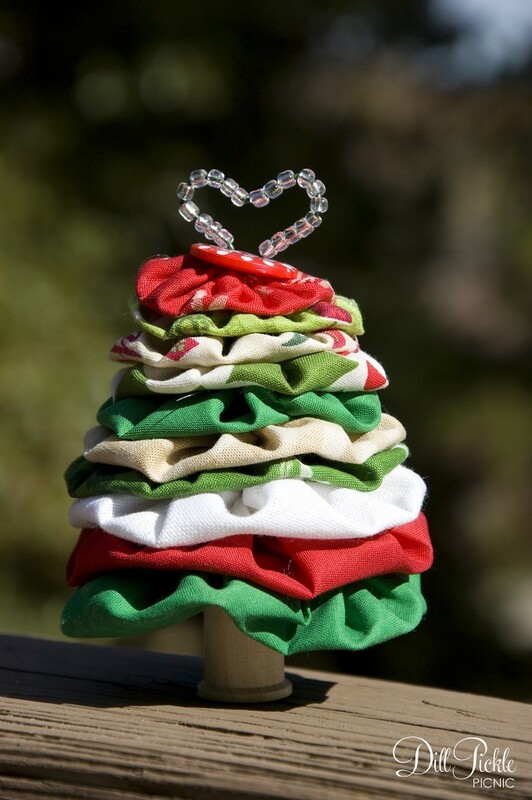 Cute huh? Oh…wait….where are the fish? Don’t worry! I have a post about fish coming up later! 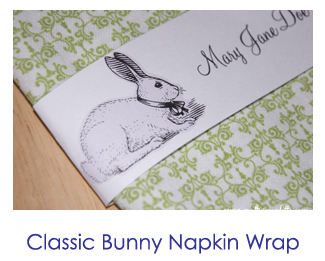 So, overall I wasn’t impressed with my first experience using freezer paper. Have any of you out there given it a try with better luck? If so, please help me out…what did I miss?